Microgen for Home and Business are plumbing and heating engineers with a Head Office in Lincolnshire and engineers available for work Nationwide. Our trained and fully-qualified Heating Engineers and Plumbers are available for all the services listed below. Call us on 01636 626636 / 01283 760107 to arrange for an emergency call or a quote. 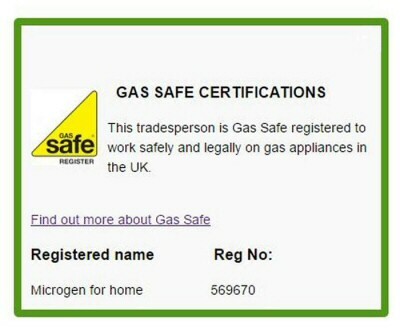 Gas Safe Registration is mandatory for individuals or companies who service and install gas appliances. The Gas Safe registration scheme replaced the scheme previously run by Corgi. Our Gas Safe registration number is: 569670. Please call us to discuss your requirements and the options available.